Even with a robust enterprise-level program for continuous lean and process improvement, Avnet—a global distributor of electronic components, enterprise IT and embedded technology—was confident it could take process improvement to the next level. Leadership identified employee adoption and usage as an opportunity to make significant gains if given the appropriate attention and support. So Avnet created a new initiative: to embed change management into the very fabric of its organizational business operations. To increase project and initiative success in every level and region of a global organization through a change management capability build. Avnet's change management leaders focused on building role-based competencies and establishing a Change Management Center of Excellence. In addition to facilitating standard role-based training programs, Avnet used a Prosci license to develop customized change management trainings tailored to the unique needs of Avnet’s widespread audience. This approach allowed trainers to teach in a format that most resonated with their audience, and it also integrated most effectively with existing programs and leadership development. The result was a globally consistent language for change in a short period of time. A Prosci license was critical to building an enterprise-wide change capability. The license gave us both the structure to standardize Prosci’s change management approach and the flexibility to integrate change management into our established strategy, leadership development and project processes. A substantial turning point for Avnet was the commitment to establishing change management as its own department. Evolving from an add-on, change management was given a defined function with resources to match. The change management department facilitated training and was also positioned to track change maturity, follow up on recent trainings, provide additional coaching and support and foster greater change management growth. Avnet was also recognized for its exceptional performance by Supply and Demand Change Executive for the fourth year in a row. 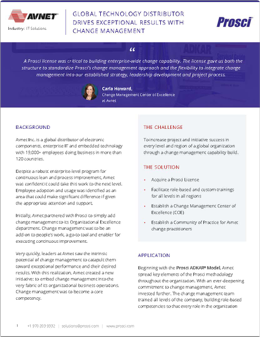 Download the full success story to see how leaders at Avnet utilized internal success stories and global collaborative change groups to propel change management growth across all regions and departments. Leaders at Avnet saw the intrinsic potential of change management to catapult them toward exceptional performance and desired results. With this realization, Avnet created an initiative to embed change management into the very fabric of its organizational business operations.